Citation: C N Trueman "The New Deal"
The New Deal, introduced by F D Roosevelt was to transform America’s economy which had been shattered by the Great Depression. The economic downturn that followed the Wall Street Crash also had a major psychological impact on America and that Roosevelt was actually doing something did a great deal to boost America’s self-esteem. In Roosevelt’s first Hundred Days many acts were introduced which were to form the basis of the New Deal. 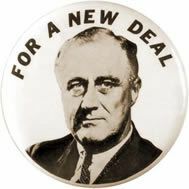 The New Deal was to cover as many issues as could be imagined – be they social, economic, financial etc. The wave of popularity that had swept Roosevelt into power meant that parts of the New Deal were passed without too much scrutiny. In later years many acts in the New Deal were deemed unconstitutional by the Supreme Court of America. The New Deal introduced acts that became part of the law and numerous agencies that worked with the Federal government in ensuring that the acts were enacted. On March 15th 1933, Roosevelt asked Congress to pass the Economy Act. This cut the pay of everybody who worked for the government and the armed forces by 15%. Government departmental spending was also cut by 25%. The saved money, about $1 billion, was to go towards financing his New Deal. On March 20th 1933, Roosevelt asked Congress to pass the Beer Act which finally killed off prohibition. The sold beer would raise revenue for the government by tax and it would also introduce a fee-good factor in that perfectly normal people who wanted an alcoholic drink would no longer be criminalised simply because they wanted a drink. This act had three parts to it. It set up the Public Works Administration (PWA) to manage public works projects; The PWA spent $7 billion and employed millions of men. It set up the National Recovery Administration to set up codes of practices for such things as hours worked, wages, unfair competition and outlawing child labour. 16 million workers were covered by these code and child labour was outlawed. Workers went on to a 8 hours week and a minimum wage of $1.25 was introduced. The third strand of the NIRA was to give trade unions the legal right to bargain with employers. Membership of trade unions increased after the introduction of this act. NIRA was declared unconstitutional in 1935. Agricultural Adjustment Act 1933 This act paid farmers to limit the amount of crops they grew or simply to dig back into the ground crops already grown. The federal government bought farm animals and then slaughtered then to raise the price of farm products.Between 1933 and 1937, farm prices doubled but in 1936 the AAA was declared unconstitutional. Tennessee Valley Development Act ’33 This set up the Tennessee Valley Authority (TVA). Its sole task was to re-develop the Tennessee Valley which encompassed 7 states and 40,000 square miles.HEP stations were built, flood control was introduced as was soil conservation. The valley was regenerated. National Labour Relations Act ’35 This act forced employers to deal with trade unions. Workers were also given the right to form and join trade unions and to take part in collective bargaining. A board was set up to investigate and punish those companies bosses who did not abide by the rules of the NLRA.In 1935 trade union membership stood at 3.6 million. By 1941 it was 8.6 million. In 1935 the CIO (Congress of Industrial Organisations) came into being. Social Security Act 1935 This act set up the first national old age pensions scheme. Workers and employers had to pay into a federal pension fund. Each state was also expected to work out a plan for unemployment insurance.This one act covered 35 million people despite opposition from Republicans who felt the whole idea smacked of socialism. Soil Conservation Act 1936 The federal government paid subsidies to farmers who agreed to leave land fallow or planted crops that put nitrogen back into the soil. The federal government also financed research into soil conservation. Fair Labour Standards Act 1938 The FLSA sort to cut the maximum hours someone could work and to raise the minimum wage for those who worked in inter-state trade.This act gave protection to over 13 million people. It introduced a 40 hour week and a minimum wage of 40 cents an hour. Agricultural Adjustment Act 1938 The act introduced the Federal government subsidising the price of many farm products. The aim was to gradually increase the subsidy until farm prices reached their pre-1914 figure to give all farmers a guaranteed minimum income. Civilian Conservation Corps of 1933 This employed jobless single men between the ages of 18 and 25. They worked for 6 months in mountains and forests where they were taught forestry, flood control and fire prevention. Nearly 3 million men took part in the scheme which ran from 1933 to 1941. Works Progress Administration of 1935 The WPA coordinated all public works schemes. It spent over $10.5 billion of Federal money and employed 3.8 million men from 1935 to 1941. It had built 77,000 bridges, 24,000 miles of sewers, 664,000 miles of road, 285 airports, 122,000 public buildings and 11,000 schools. Reconstruction Finance Corporation This agency loaned money to state and local governments to assist the poor. It also lent money to firms which were in debt or wanted to invest. Farm Credit Administration This agency used Federal money to pay off farm creditors and save farmersfrom bankruptcy. Home Owners Loan Corporation 1933 This agency used Federal money to pay of mortgages so that home owners did not lose their homes.